The top echelons of the Israel Police are reportedly set to finalize their recommendations on whether criminal charges should be lodged against far-right Prime Minister Benjamin Netanyahu in the wake of two corruption probes. Police chiefs, including Commissioner Roni Alsheich, and the heads of the national police force’s Investigations Department will present their recommendations on “Case 1000” and “Case 2000” next week, Israeli TV news reported Tuesday, citing a police source. The recommendations are widely expected to include a proposed indictment on bribery charges, and will be made public once presented to the state prosecution, the report said. The investigations into Netanyahu have continued for over a year. In the so-called Case 1000, Netanyahu and his wife, Sara, are suspected of receiving illicit gifts from billionaire benefactors, most notably hundreds of thousands of shekels’ worth of cigars and champagne from the Israeli-born Hollywood producer Arnon Milchan. In the past, Netanyahu has acknowledged accepting gifts from Milchan but maintained they were exchanged between friends and did not constitute bribery or breach of trust. He has denied any wrongdoing. “It is allowed, according to the law, to receive gifts from friends,” Netanyahu said at the Knesset last January. Case 2000 involves a suspected illicit, quid pro quo deal between Netanyahu and Yedioth Ahronoth newspaper publisher Arnon Mozes that would have seen the prime minister weaken a rival daily, the pro-Netanyahu US billionaire Sheldon Adelson-backed Israel Hayom, in return for more favorable coverage from Yedioth. Also questioned by the police recently was MK Eitan Cabel (Zionist Union), who sponsored a bill that would have made it illegal to distribute a full-size newspaper free of charge. The only newspaper that would have been affected by the bill was Israel Hayom, and the legislation would have helped the newspaper’s major competitor, Yedioth. Every Saturday night for more of a year, demonstrations have been held outside Mandelblit’s home in Petah Tikva, alleging that he is stalling in the corruption probes against Netanyahu. 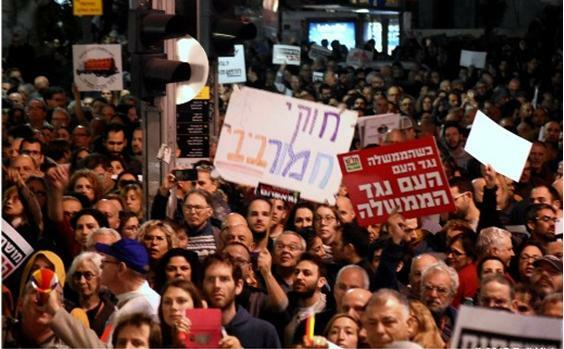 They have spawned much bigger anti-corruption rallies, held in Tel Aviv and in 19 locations across the country from Rosh Pina in the North to Eilat in the South. The prime minister has also been linked indirectly to “Case 3000,” a large investigation into suspected corruption surrounding the multi-billion shekel purchase of naval vessels and submarines from a German shipbuilder ThyssenKrupp. While Netanyahu has not been named as a suspect, close associates of his, including his personal aides, have been arrested or questioned.